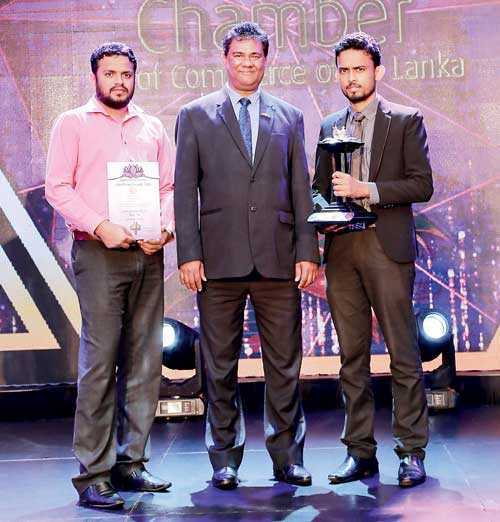 Sripalie Contractors Ltd emerged as runner-up in the Construction Sector category at the 15th edition of the prestigious National Business Excellence Awards 2018, organised by the National Chamber of Commerce. The awards were presented at a gala ceremony held on 5 December at Hotel Hilton. The National Business Excellence Awards is an annual award competition conducted by the National Chamber of Commerce of Sri Lanka (NCCSL) with a view to recognising excellence in each pillar of business enterprise. By emerging as the runner-up, Sripalie Contractors Ltd showcased their pre-eminent presence in the construction sector and their capacity and strength to move even further ahead. De Silva mentioned that the company has also received a Merit award in the Construction sector at the NBEA of the previous year. “The fact that we have been able to get runner-up position this year means we, as a company, have been successful in maintaining and improving our performance”. He went on to attribute the success of the company to the, “unconditional commitment shown by the management team, engineering team and dedicated staff members of the company.” He also recognised the support given by the valued clients, consultants, principal bankers, financial institutions, suppliers, sub-contractors, friends and well-wishers, and acknowledged that this achievement is not only one for Sripalie but also for all the stakeholders of the company. Furthermore, he pointed out that society has an overall negative image of the construction industry in Sri Lanka compared with other industries, and that Sripalie Contractors Ltd is one of key figures to help roll this back by persistently adding value to the industry. The company has proven their capabilities and strengths in Business Management, Financial, Leadership, Capacity Building, Social Responsibilities and Environmental Concerns, all of which were examined and evaluated by this awards competition.